Last summer I tried my hand at pebble mosaics (see Making Pebble Mosaic Stepping Stones in the Tutorials). I designed a total of 12 round stepping stones: three paths, three designs, four stones each path. These 9′ paths lead from sidewalk to street. 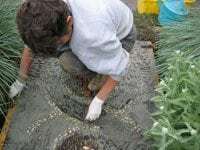 Here in Portland, Oregon, gardeners often remove the grass in the strips and replace them with flower, vegetable or perennial beds. The front and side strips of my home (a corner lot) are part xeriscape, part vegetable garden and part orchard (fig, pear, plum and cherry trees). Last summer I was completely in love with my new paths and pebble stepping stones. Then followed the winter of my discontent. I’m constantly, vexingly setting higher bars for my garden, with both plants and hardscaping alike. There’s little rest around here! My new dream was to have three complete pebble mosaic pathways, not just individual stepping stones. 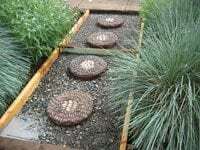 This spring, out went the stepping stones and in went the pathways, though I did incorporate these stepping stones into the pathway designs. Read on for the method to my madness. • 2×6 lumber and stakes. Approximately 125-150 pounds of pebbles were needed for one 3’x9′ path. The orange and blacks were gathered during several dog-walking trips to the local river (Daisy played in the waves while I obsessed on the shore); the other rocks were purchased in 50# bags labeled “Mexican river rock.” These bags held quite an array of colors; wetting the stone helped with color sorting. I sorted into separate containers by color only; sorting can also be done by size and shape. It all depends upon your design and how much trouble you care to make for yourself! My parking strip is 9′ deep and given this relatively short distance, I chose to make a straight (rather than curved) path 3′ wide by 9′ long. On the computer, I created a 3″ x 9″ template with four evenly spaced circles (representing the mosaic stepping stones that were to be incorporated into the overall design). When designing, I typically do several sketches at once and then let them “ferment” for a few days. It saves a lot of thinking time – the subconscious does most of the work. Some side-notes on design: An assortment of colored stones are not necessary for interesting design. Visually striking patterns can be made with one color by using different size stones and/or by varying the directional alignment of the stones within the design itself. If you do choose a multi-color design, first sketch out your ideas using colored pencils. What looks good in the mind’s eye doesn’t always translate. Simpler is always safer. To continue: with the help of Richard, my friendly neighborhood handyman, I next excavated path trenches. Digging 5 ½” down below the intended finished path level, we staked and leveled the 2×6’s along both sides of the trench. Since 2×6’s are actually 5 ½ inches wide, the tops of the boards created the perfect level template for the pouring of mortar and setting of stones. Approximately 2-2 ½” of crushed rock was then shoveled into the bottom of each trench. The three paths consumed one cubic yard of rock which we stamped firmly into place with our feet. We emptied one bag of mortar into the wheelbarrow and began adding water, mixing with a hoe until the consistency approximated that of a stiff batter. (Wear a dust mask for this process.) 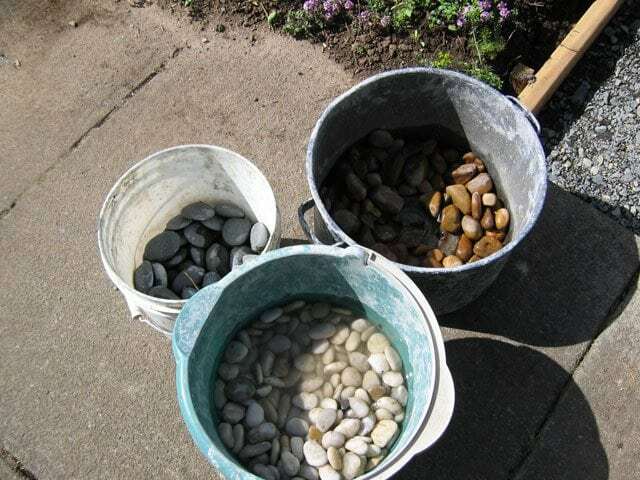 A correct consistency is important for two reasons: first, too much water weakens the structure of hardening mortar and second, the pebbles want to slump and sink in an overly wet mix. Mortar mix, not cement mix, is ideal for pebble mosaic work because it’s smooth- a mixture of Portland cement and sand containing no rocks. Before scooping the mortar into the pathway, we sprayed the crushed rock and pre-set stepping stones with water. Mortar adheres better to moist surfaces. Likewise, the pebbles themselves need to be moistened throughout the project before they‘re set in place. Mortar was then shoveled into the first section of the trench and roughly leveled to ¼”-½” below the tops of the 2×6’s. Using a stick, the first section of the design was scribed into the mortar. We were now off and running with the pebbles. 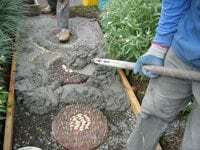 We first inlayed the large and medium-sized rocks, then filled the gaps with the small fry. About half the stones’ depths were pressed into the mortar to prevent dislodgment. It takes a little while to get used to this pebble-setting process because as the stones displace the mortar, the mortar bulges and oozes into another section, heaving the pebbles there. The larger the stones the more pronounced the bulging. It finally dawned on me to scoop out part of the mortar before setting these bigger stones. It took us less than an hour to set stones into one 80# bag batch. One bag covered approximately 3-4 square feet. The mortar begins firming in the course of an hour, but we had plenty of work time. Please note: the warmer the weather, the faster the mortar sets. For that reason, forego mortar work in the middle of summer because accelerated cure times lead to cracked mortar. If the weather turns warm in the middle of the project, spray the path 4-5 times a day for a few days to moisten. Cover with plastic sheeting as well. To level the pebbles as the path grew, we laid a 2×12” board across the path. We lightly stomped on this until all the stones beneath the board were level with the tops of the 2x6s. I became a little disenchanted with this method because it affects such a large area of stones and displaced some stones in ways I wasn’t happy with. I switched to using a wooden finishing float and evened the rocks as I went. This method probably doesn’t level the stones as uniformly as does the board-stomping method, but I figured as long as the path didn’t have any sudden rises or dips, there’d be no tripping hazard. The finished paths do have some subtle undulations , but that’s part of their charm. After each one-bag section of stones were laid, I very lightly misted the stones with a hose. This misting exposed the surfaces of the mortar-smeared stones as well as loosened the mortar. 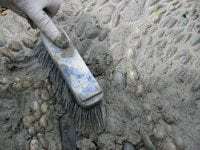 With a whisk broom, I gently “sculpted” the mortar around the rocks, uncovering any partially buried stones, moving mortar to stones that weren’t covered enough, in general- ensuring that the mortar was smooth and tightly contacting each and every stone. On our first day, we got a late start and were unable to complete the entire path. Rather than leave a jagged, slumped edge of mortar that would firm overnight (making for a difficult transition the next morning), Richard created a “dam”-a 2×6” slice of plywood spanning the width of the path. We jammed this up into the edge of wet mortar and set the remaining stones as close to the board as possible so no visual discontinuity would be apparent between day one and day two. 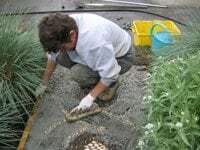 Each morning after a new path had firmed overnight, I was up early hosing the stones then lightly scrubbing away any gobs or thick coatings of mortar mix with a wire brush. The mortar is still a little soft at this point so you want to go easy. After this cursory cleaning, I left the paths alone. Too much cleaning can pull away too much mortar. A week or so later, the final cleaning was done with muriatic acid. A thin white film of Portland cement was still coating the stones. Muriatic acid can be purchased in any hardware store, but be sure to follow safety instructions when using this stuff. You’ll need gloves, goggles, a respirator and skin protection. I “sealed” my face with Vaseline jelly. The stones are cleaned by rubbing with muriatic-dipped rags. After cleaning, spray the path with water – this neutralizes the acid. The stones will really shine now. The boards can also be removed with a hammer and large cold chisel or the tip of a shovel. This project created quite a stir in the neighborhood. Some of the neighboring kids came and helped insert stones, the adults provided plenty of questions, comments, oohs and aahs, some even vowed to make their own paths. I’m constantly admiring the paths, as well as enjoying the reactions of passersby as they discover these magic carpets.